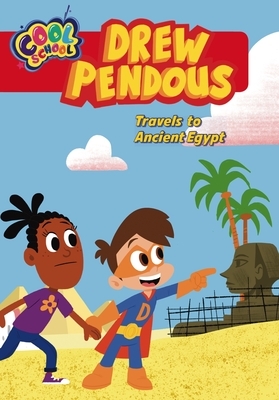 When the Cool School takes a field trip to the art museum, they notice something strange: the Sphinx is missing his nose Drew Pendous uses his Mighty Pen Ultimate to sketch a time machine, and he and Ella travel back to ancient Egypt to investigate. It turns out Drew's evil twin Ray Blank has rewritten history by erasing the nose Can Drew and Ella stop Ray and set the timeline straight? This very young graphic novel is lots of fun. Driver Studios is a youth and family entertainment company that creates original content for kids, including the Cool School series on YouTube. Cool School and Drew Pendous were created by writer/producer Rob Kurtz. Rob has written and/or produced over 100 hours of prime-time television, including Boy Meets World and Grace Under Fire, as well as the Fox animated film Everyone's Hero (2006). Rob previously served as the creative director for the Children's Publishing Group, Worthwhile Books. At Driver Studios, Rob has overseen creative content for Nickelodeon, Mattel, American Girl, DreamWorks, and Fox Family Films. Rob Kurtz lives in the New York City area.